As 1 brings up the ball, 3 sets a screen for 4 who moves to the low post to receive the pass from 1. After setting the screen, 3 moves to the right wing. - 4 comes off of a cross screen set by 5 to establish position on the right block. Once 1 has entered the ball into the post, he makes a banana cut across the paint. Meanwhile, 3 moves to the opposite wing. 1 curls around 5 to receive a quick pass from 4. 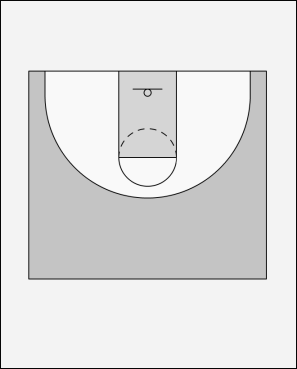 If the defender of 1 sinks into the paint to beat him to the spot, 1 can flare out to the wing for a jump shot. 1 finishes under the basket. 4 and 5 get in position for a rebound.